Washington, D.C. —Senators from Minnesota, Wisconsin and Wyoming yesterday introduced the “War on Wolves Act,” a companion bill to legislation introduced last week in the House that would strip federal protections from wolves and allow trophy hunting and trapping of the species in four states. If the legislation passes both chambers and gets signed by the president, it would hand the fate of wolves in Minnesota, Michigan, Wisconsin and Wyoming over to states whose management wolf plans two federal courts ruled inadequate to securing the species at legally required population levels in absence of Endangered Species Act protections. 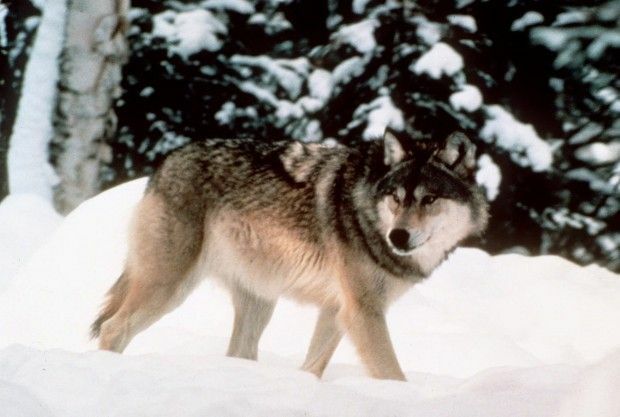 ‪‎Wyoming‬ has been fighting Washington over delisting since 2003, objecting to the federal standards and offering its own plan for controlling wolf populations. Wyoming treated wolves as “vermin” and allowed them to be hunted along the borders of Yellowstone National Park and throughout National Forest lands south of Jackson Hole. 219 wolves were killed in 80% of Wyoming opened to “unlimited” killing since the delisting in late August 2012. 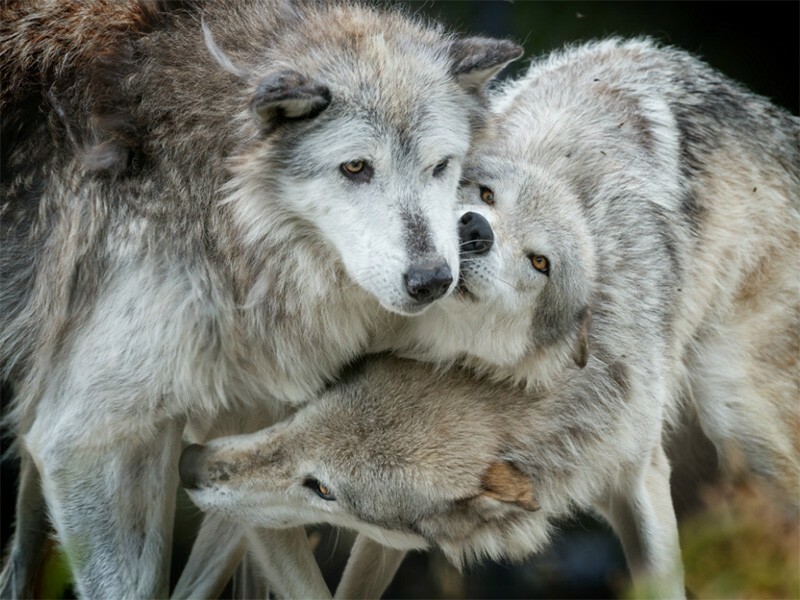 Overruling U.S. wildlife officials, a federal judge (Amy Berman Jackson) restored protections for gray wolves in Wyoming in September 2014. Wyoming’s kill-on-sight attitude as a wolf management plan throughout much of the state is a disgrace. Wyoming officials need to be conscious of the fact that “sport” (trophy) hunting of wolves is inconsistent with the need for continued protections for this essential, iconic species. Labeling the wolf as a predator that could be shot in four-fifths of the state is hardly a way to treat a species freshly removed from the ESA. Hi folks. I’m going to try something different on my blog. From time to time, I’ll post reminiscences from Koda, the dog who grew up in the Wyoming wilds. Here’s the first one. The stories below took place when Koda was about 7 months old. We were still living in California and traveling by car back and forth to Wyoming. After Soona died when Koda was about 1 1/2 years old, we moved to our cabin in Wyoming full time. After a long drive, Leslie (she’s my person), Soona (she’s my grandma) and I were at our new home, a place not at all like the city we came from. This place was vast—just mountains, trees, and more smells than I ever could have imagined. One morning we were all up in the flats above the house. Leslie was piling little rocks. Soona and I were sniffing and watching. Without warning, Soona made a beeline for the woods. I was still little, only 9 months old, and didn’t know one smell from another, but I knew she smelled something that I didn’t, so I followed her. Leslie was worried for the old lady. The woods, she said, could be dangerous, especially for old dogs. So she followed us. And what do you know, Soona had a great find: a turkey partially eaten by a coyote! We munched on the bird for a while. I know turkeys because they live in California. But I didn’t know they were here in Wyoming too. From that time on I’ve watched them and got to know them. Leslie taught me to let them be. In the winter they come to our yard where I sit outside on the porch while they peck and pick for seeds and corn we sometimes lay out for them. Mostly they amuse me and, as long as don’t run after them, they pay me no mind. The flock of turkeys I’ve come to know. And they know me. One day just Leslie and I went for a hike up a stream, leaving Soona at home. We returned a different way, a route through sparse meadows peppered with small trees and gullies. I stayed just a bit ahead, yet kept close to Leslie. We were on the side of a small arroyo when I smelled something watching us from behind a tree. I turned to look, and saw the most beautiful girl I’d ever laid my eyes on. She appeared to be a dog, yet she had a different aura about her. My heart jumped and an irresistible urge took over my entire body. It was if this black dog were a magnet drawing me towards her. I’d already met and played with many dogs in my life at that point. I was only 7 months old, but I already knew to ‘ask’ before I could go play. But this dog…she was like no other, and I just had to know what, and who, she was. She seemed to be the essence of what a dog is; a wildness that was wilder than I ever could be. Really, I just lost my head. And so I ran after her, silently. I heard Leslie screaming for me, calling my name. But Leslie’s voice was like a dream in the background. That black dog was so fast that I finally gave up trying to catch her. But, I’ve got to tell you, that was the most exciting moment in my life! I ran back to the little arroyo where I’d left Leslie. She hugged me and seemed so relieved to see me. She told me that I’d seen a wolf and I was lucky that there weren’t other wolves waiting for me there. That wolves weren’t like dogs and they didn’t want other wolves, or dogs, in their territory. But all I know was that was one truly wild and free ‘dog’. We rested in a nearby wikiup in the meadows. Leslie petted me, then scolded me for running away. After a time, we headed back in the direction where I’d run after that wolf, till we came to a trail. And what do you think I found at the trail? That wolf got so excited she’d thrown up her lunch! I guess I made an impression on her too. 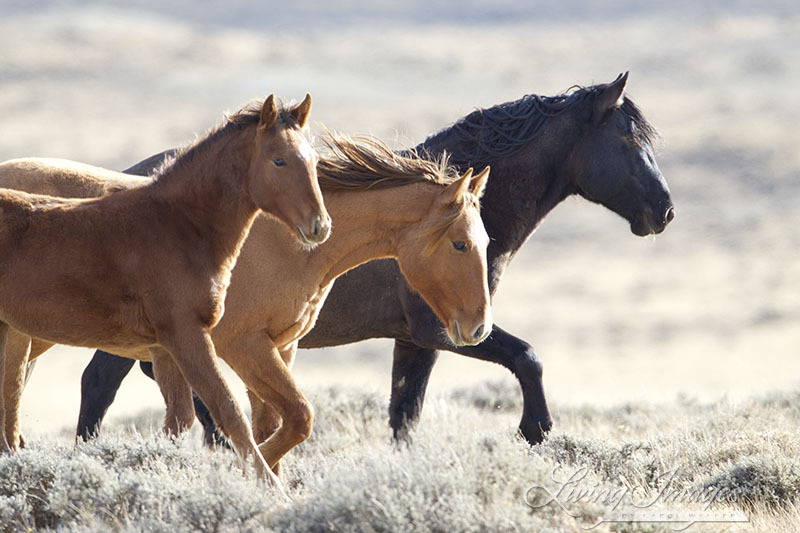 In September and October of 2014, 1263 wild horses were removed from Great Divide Basin, Salt Wells Creek and Adobe Town Herd Management Areas by the BLM. 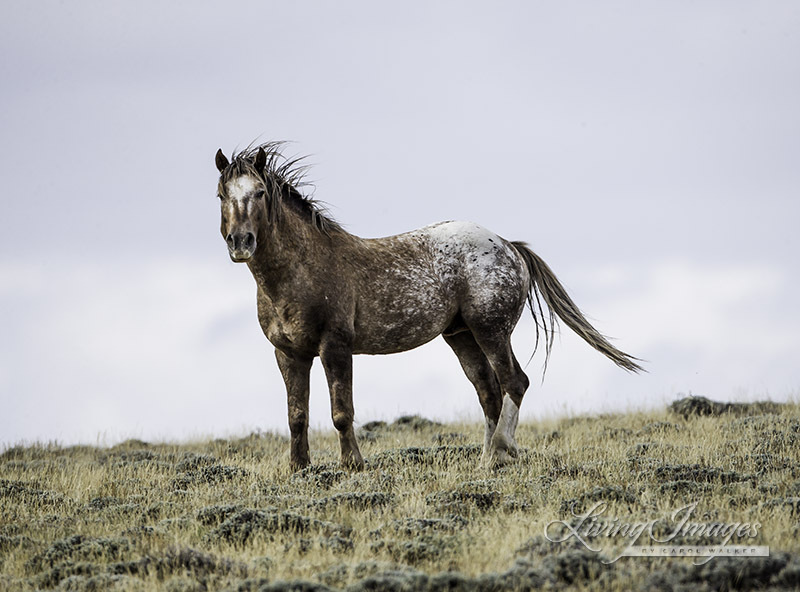 This was done due to a lawsuit and pressure and influence exerted by the Rock Springs Grazing Association, a very small but powerful association whose goal is to eradicate wild horses from both private and public lands in Wyoming. 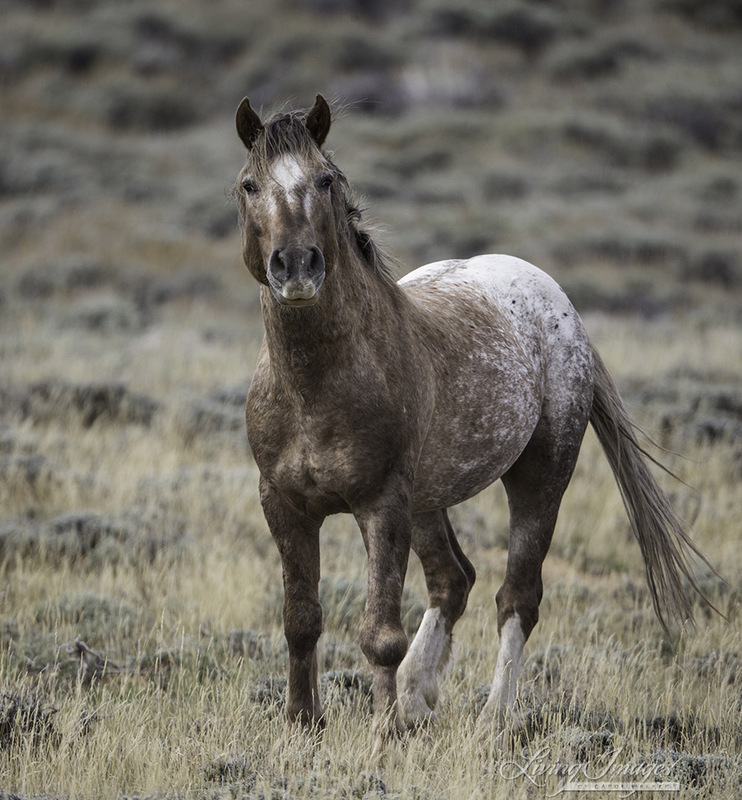 Although in the 80s an agreement was reached between the BLM, wild horse advocates and the Rock Springs Grazing Association for how many wild horses would be allowed in the vast checkerboard of private and public lands in the Red Desert of Wyoming, the grazing association contended that the BLM was not keeping the numbers of wild horses in check, so their solution was to pressure the BLM to remove all of them, not only from private lands but also from public lands on 2 million acres, and they forced the BLM to manage the public lands in the Checkerboard Area in one block, as though they were part of private lands, even though this is illegal. 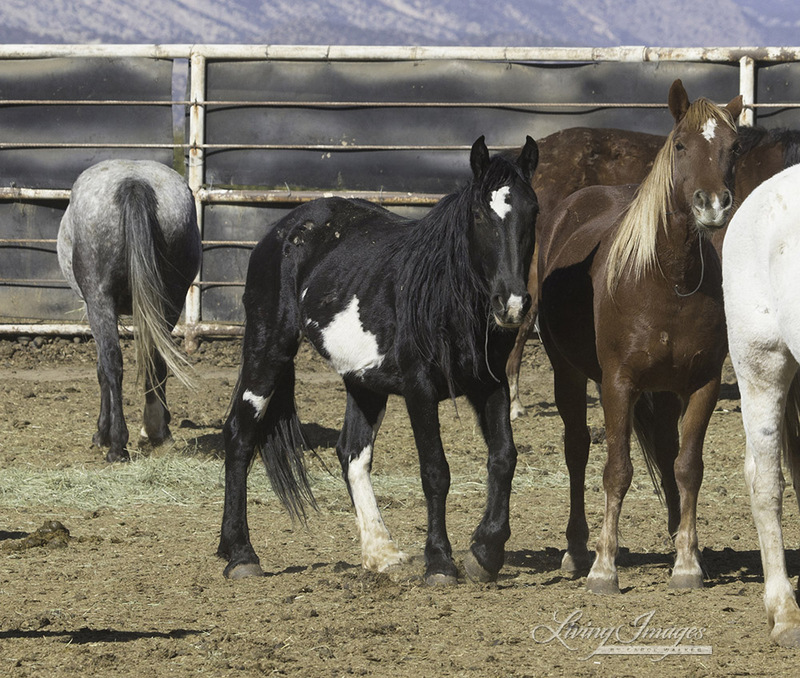 The court denied the advocates fighting to represent the wild horses a Temporary Restraining Order and Emergency Injunction to stop the roundup, so currently the wild horses removed are in short term holding facilities: about 600 are at Rock Springs, Wyoming, about 500 in Canon City, Colorado and about 100 youngsters are at Axtell, Utah. 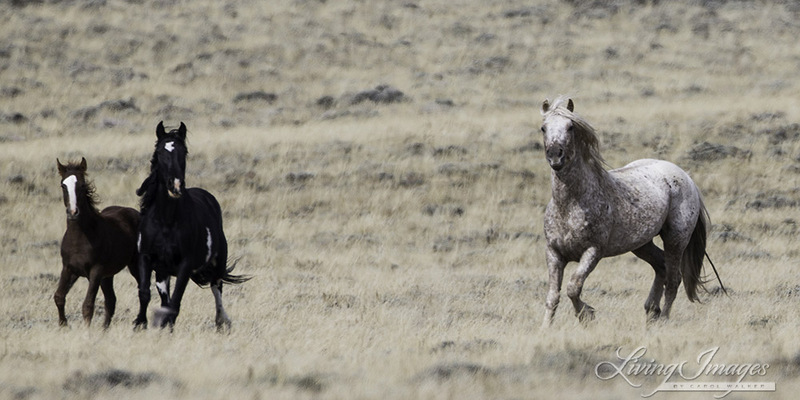 The wild horses are the victims in this outrageous land grab struggle. Even though there were fewer than the Appropriate Management Level in each of these Herd Management Areas at the time of the roundup, with no opportunity for public comment the horses were removed, and now only 89 wild horses remain in Great Divide Basin, 29 in Salt Wells Creek and approximately 515 in Adobe Town. I attended as many days of the roundup as I could. It was a very different experience than any roundup I had been to before in Wyoming because they were trying to capture every single horse in the Checkerboard Areas. This resulted in many more deaths than usual – a total of 14, and also resulted in the capture of many more older horses than usual. They spent hours driving single bands over and over again to the trap, when the older stallions knew what was happening and valiantly tried to evade capture. 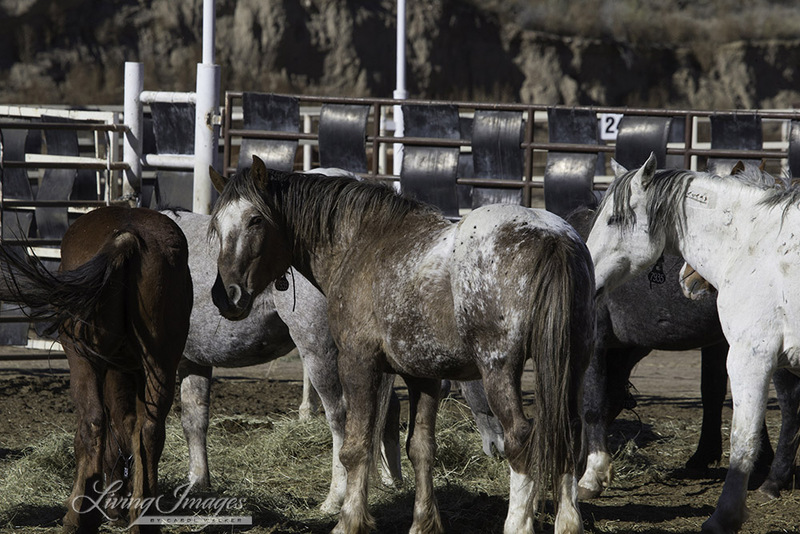 The lawsuit that we advocates brought against the BLM continues, but the horses have been captured and removed already, and wait for their fate. 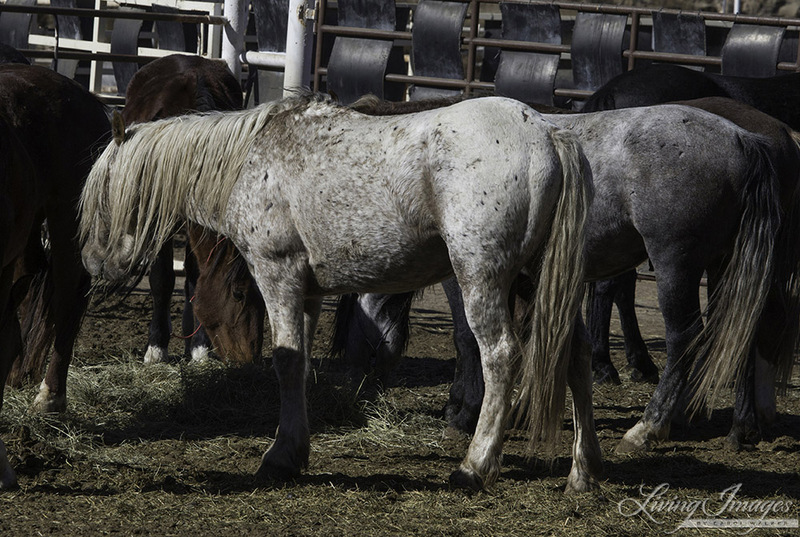 A small percentage of horses that were captured have been adopted, and this is where my story begins. One day while I was staying in Rock Springs waiting for the BLM to continue the roundup, I drove into Adobe Town. This area is extremely remote, over 30 miles from the highway on dirt roads. You can drive for many miles and not see a single horse on the roads I traveled, mainly because most of them in this area had already been rounded up. But as I approached Pine Butte and Sand Butte near Eversole Ranch, as I headed up a hill I saw several groups of wild horses peacefully grazing. It is common in some herd areas for family bands that know each other to stay close together at times. It is a wonderful opportunity to study the behavior and family interaction of the horses. I was amazed to see many Appaloosas in these families. I had never seen an Appaloosa in the wild before and the different and varied coat patterns were striking. I first observed a stallion whose coat looked like snow had fallen all over it. He proudly lifted his head and stood his ground as I approached. 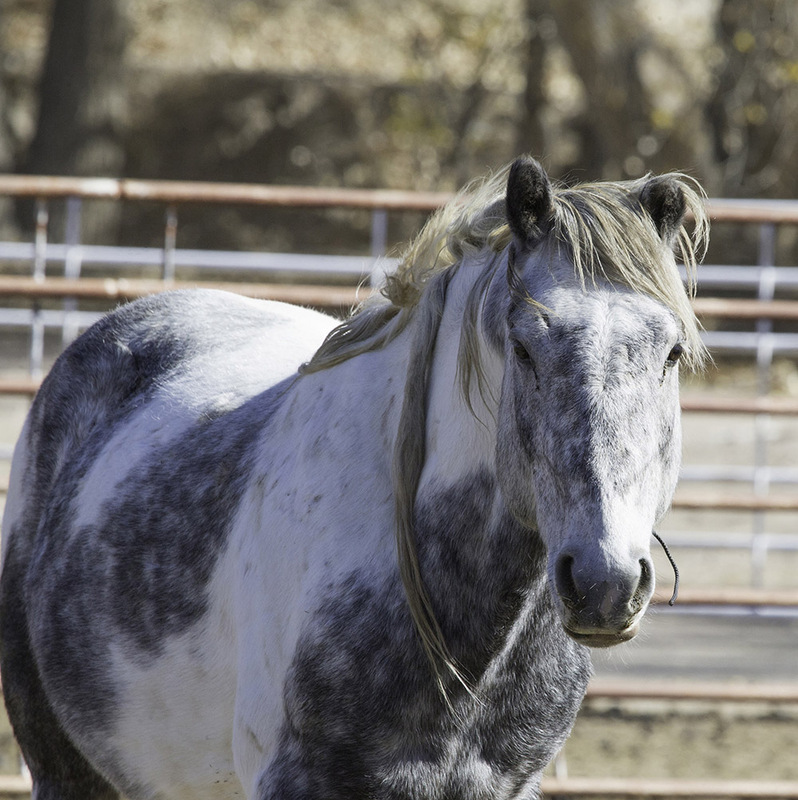 He had a striking black and white pinto mare with dramatic markings and a small foal. Then I observed a large family with a stunning sorrel stallion, and they were very curious about me, running by and then running toward me to get a closer look. 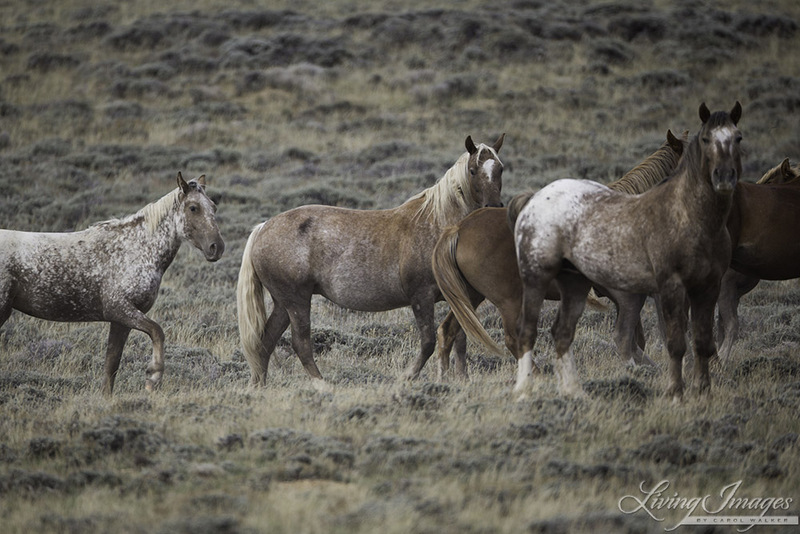 Then I turned and saw an older stallion with bronze highlights glinting off his coat, and an Appaloosa “blanket” over his rump. 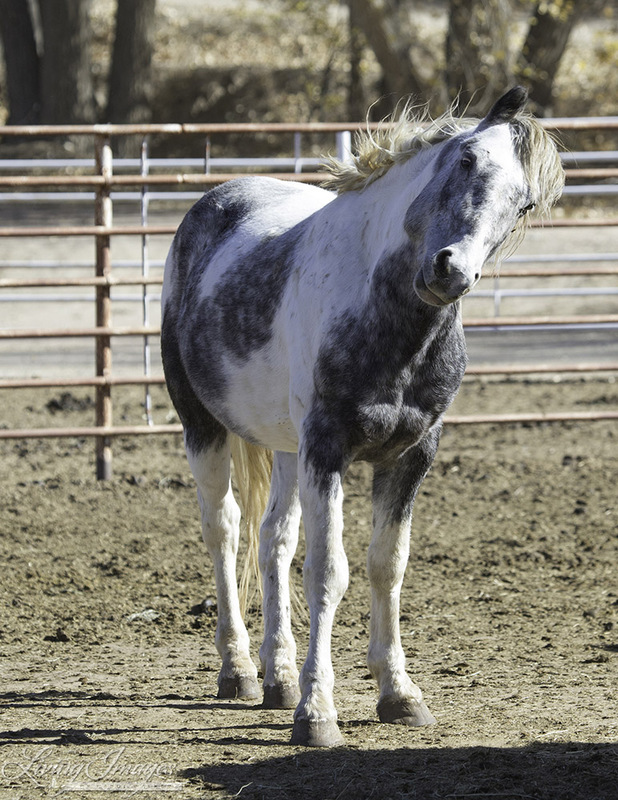 Despite an enlarged knee, he trotted by with a float in his gait, proudly protecting his family and investigating a new person is his territory. I was enchanted by his pride and by his beautiful family, which included a gorgeous Appaloosa mare whose coat also looked like snow had fallen, and a protective sorrel pinto mare, and two sorrel mares. They moved past me and up onto a ridge, and the stallion paused to look back at me. I walked back to my car and pulled out my map. My heart sank as I traced the pattern of the Checkerboard over the area that I was in. These horses did not stand a chance. Their freedom was going to be measured in days, not weeks, not years as it should have been. After seeing the last days of the roundup, I made plans to go to Canon City to see the wild horses that had been removed. Although the BLM referred to all of the wild horses that were removed in this area as being from Salt Wells Creek, many were from Adobe Town. I was determined to find some of the horses I had seen that day. I also called Manda Kalimian, of the Cana Project, formerly Seraphim 12, http://www.seraphim12foundation.org/ and I told her about these horses, and asked if there was any way she could take some of the older horses. 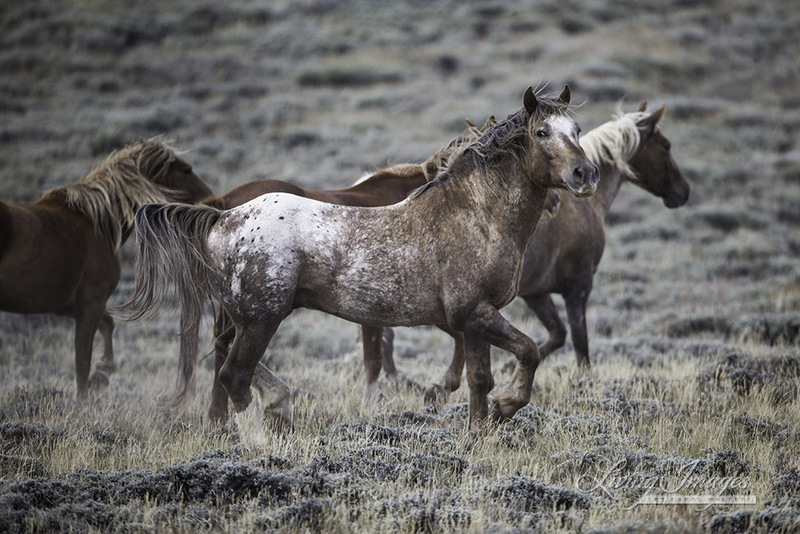 Manda immediately said she would work on it, and we corresponded by phone and email about where these wild horses could find a new home. 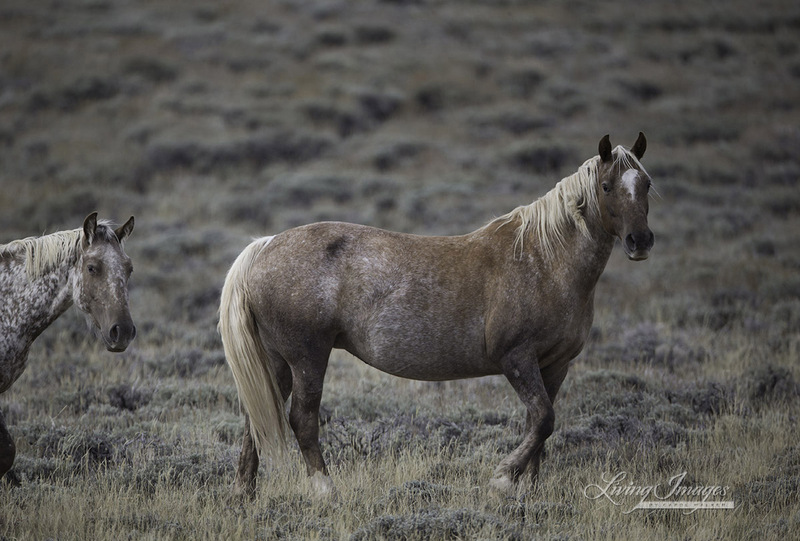 I knew that Manda with her great love for horses and concern about the wild horses and their fate would manage to make something work, and I started to feel hope amidst the great despair I had been feeling these last few months. When I arrived at the corrals at the BLM Canon City facility, the first horses I saw was the bronze Appy stallion, who I named Bronze Warrior. He was peacefully munching hay and quietly observing near the other older stallions in his pen. I was so glad to have found him! In the same pen I also saw the amazing Appaloosa stallion I named Snowfall with the pinto mare, and then was able to find her as well. She was aged at 20 years old, and Bronze warrior at 22 years old, the oldest stallion that had been rounded up. I sent Manda the photos, and this fueled the fire for both of us to find a home for these horses. I also emailed Kathi Fine at Rock Springs to see if I could find some of the mares in Bronze Warrior’s family so that at least two families could be reunited. The stallions have all been gelded at this point, but at least they can be with their mares again. In the meantime, Manda called me with the wonderful news that she had just gotten off the phone with Susan Watt of the Black Hills Wild Horse Sanctuary in South Dakotahttp://www.wildmustangs.com/ and that Susan was very excited about taking the older horses. She was also enthused about being able to reunite at the sanctuary not one, but two families who had been ripped apart during the roundup. This was such welcome news. I had first met Susan two years ago when I went to interview her and see and tour the sanctuary, and I knew that she would take amazing care of these horses. The Black Hills Wild Horse Sanctuary is an amazing place, and will be perfect for older horses to live out their lives in peace, and as free as possible. We developed a plan. Kathi Fine at Rock Springs told me that she had at least two of the mares we were looking for, but since they were short handed none of the wild horses rounded up in the fall would be available for adoption or sale until February. So we decided to take the four in Canon City to the Black Hills Sanctuary this week and to take a second load from Rock Springs to the Sanctuary in February when the horses were ready to go. I will be sending updates and photographs of the horses’ arrival this week at the Black Hills Wild Horse Sanctuary, with the reunion of Snowfall and Diamond Girl who have been separated since the roundup. Next month I will be documenting the reunion of Bronze Warrior and his family. The beautiful sorrel stallion and his family. I looked for him in Canon City but did not find him – most likely he is in Rock Springs. Colorado Farm Bureau will be looking to improve national wild horse and burro management at next Tuesday’s voting delegate session during the American Farm Bureau Annual Convention in San Diego, Cali. 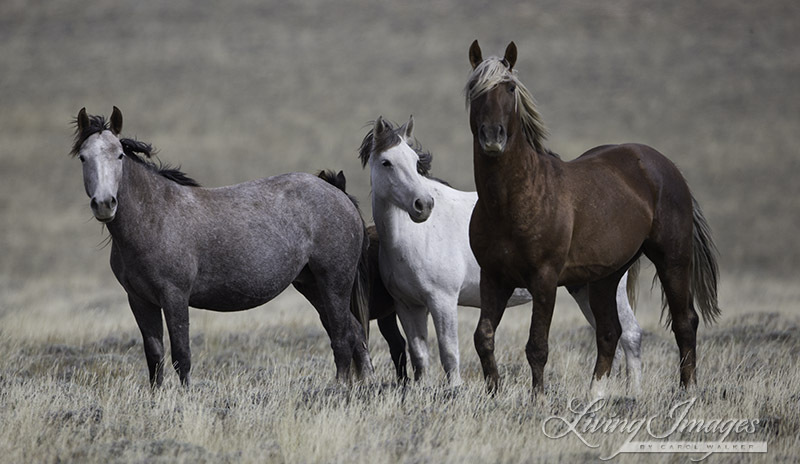 CFB President Don Shawcroft said Colorado ranchers will be calling on the federal government to enforce the already-standing Wild Free-Roaming Horses and Burros Act. 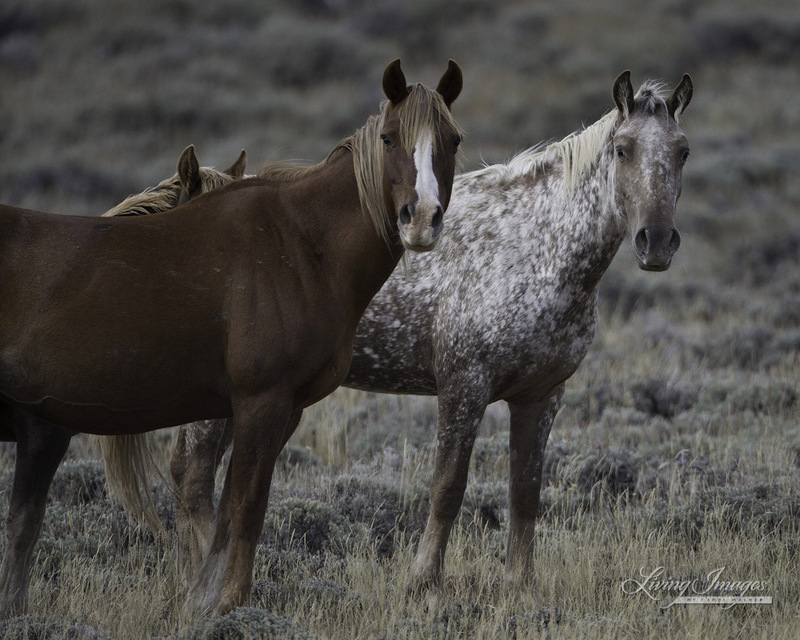 “The most important thing in our recommendation is a clear call on the Bureau of Land Management to follow the act as written and keep those animals within the determined numbers in areas where the animals are managed,” Shawcroft said. Shawcroft said cattle and sheep ranches that share land with wild horse populations have suffered the most from the lack of monitoring due to competition over grazing resources. “The biggest problem is that where those animals exist, they are not being managed and the numbers are not being controlled. It’s an issue for those with grazing rights in some areas,” he said. Jason Vermillion, chair of Colorado’s Young Farmers and Ranchers and an alternate for the state’s voting delegation, said the issue is especially important on the Western Slope where ranchers have felt the greatest impact of the uncontrolled wild horse population. The issue was brought forward by CFB members in Mesa County. Shawcroft also pointed out that the horses themselves suffer from lack of management and, as a result, lack of protection. 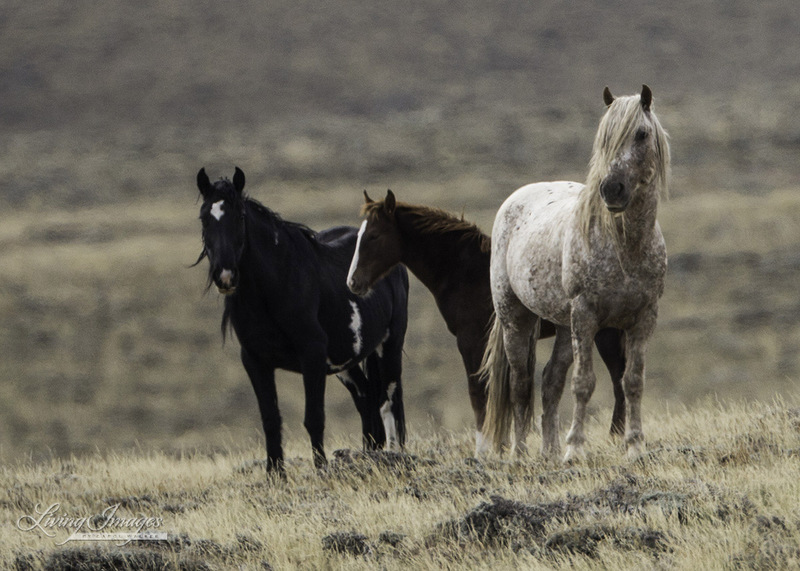 On Dec. 8, the state of Wyoming filed a lawsuit against the Department of the Interior and the Bureau of Land Management over wild horse management and called on the agencies to enforce the Wild Free-Roaming Horses and Burros Act. Wyoming Gov. 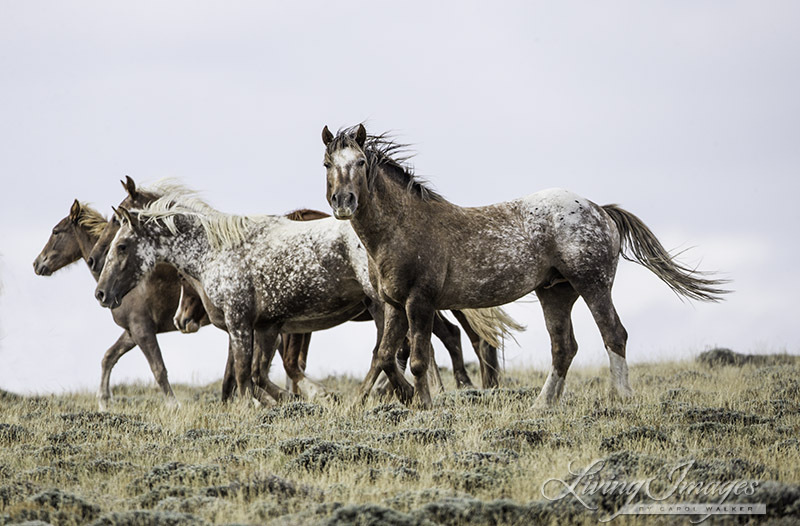 Matt Mead said the Bureau of Land Management currently lacks the resources to enforce the act and must be provided more funding to properly manage wild horse populations. The state of Wyoming is appealing the reinstatement of federal wolf protections. CHEYENNE, Wyo. — Wyoming and U.S. government officials have filed separate notices that they will appeal a ruling by a federal judge that reinstated protections for wolves in the state. The notices filed this week target the decision in September by U.S. District Judge Amy Berman Jackson of Washington, D.C., who rejected a Wyoming wolf management plan that took effect in 2012. The state plan had classified wolves in most of the state as predators that could be shot on sight. Jackson agreed with the U.S. Fish and Wildlife Service that wolves in the Northern Rockies have recovered. However, she ruled that the federal agency should not have accepted Wyoming’s nonbinding promise to maintain at least 100 wolves and 10 breeding pairs outside of Yellowstone National Park and the Wind River Indian Reservation. The Fish and Wildlife Service reintroduced wolves in the Northern Rockies in the 1990s. The animals have since expanded their range. Despite the plan to appeal, Wyoming Gov. Matt Mead said Thursday he believes that congressional action holds the best chance for resolving the long-running dispute over manage wolves in the state. Congress previously specified that there could be no legal challenges to decisions to end federal protection for wolves in Idaho and Montana. Many Wyoming residents believe the wolf population in the state should be restrained to minimize the killing of livestock and other wildlife by the animals. Wyoming has been involved in nearly continuous litigation against environmental groups and the U.S. Fish and Wildlife Service over the state’s effort to gain control of wolf management. “To state it as simply as possible, we’re trying to cover all bases,” Mead said of the state’s notice that it will appeal Jackson’s ruling. Mead said his administration is working with the state’s congressional delegation on legislation to turn over wolf management to Wyoming and prohibit further legal challenges. Under the plan rejected by Jackson, Wyoming had divided the state into two general zones. Trophy hunting was allowed in a flexible area bordering Yellowstone, where the number of wolves killed was controlled by license sales. Wolves were left unprotected as predators in the rest of the state. Trophy hunting is not allowed under federal management. Mead previously said the state had almost 190 wolves and 15 breeding pairs after the first hunting season in 2012 and just under 200 wolves and 15 breeding pairs after last year’s hunt. Jackson’s ruling derailed the state plan to allow hunters to kill a maximum total of 43 wolves starting in October. Tim Preso, a lawyer with Earthjustice in Montana, represented a coalition of groups that sued to overturn Wyoming’s wolf plan. He said his clients are prepared to assert that the appeals court should uphold Jackson’s ruling. Preso said it appears Wyoming’s best chance at restoring state wolf management would be to fix the flaws in its management plan rather than challenge the judge’s ruling. Preso said the confirmation of a female gray wolf from the Northern Rockies near the Grand Canyon shows that wolves have the ability to find places to live if humans don’t kill them.